I bought the OES 8 x 10 Flat Tarp because of my curiosity and the idea of going lighter. It was actually an impulse buy, and when I first placed the order, I had ordered a totally different tarp from OES. I was lucky though, since OES in a one man shop, and this one man had decided to take time to go out for a few days. During these few days, I realized the tarp I ordered initially was more for hammocking. So, I finally changed to the 8 x 10 flat tarp, and Brian was completely cool with that. He whipped the tarp up, and got it out to me pretty quickly, along with the guy-line kit I also ordered. Upon my first impression of the tarp, I was a little shocked. Until this time, I was used to the blue tarps found at department and hardware stores. This was nothing like it. This thing was thin! But of course that is to be expected, since it is constructed of 1.4 ounce silnylon. Another thing I quickly noticed about it was how slippery it was. The tarp is constructed of 2 pieces of silnylon, sewn long ways down the middle which forms the ridgeline. The edges of the tarp are reinforced with a piece of webbing (not sure what it is made of though). There are 10 tie-outs lining the edge of the tarp. 1 at each end of the ridge line, 1 at each corner, and then 2 more on each of the long sides, evenly spaced. These tie-outs are “Reinforced with triple stitched, webbing backed edging and 1000D Kevlar ripstop tieouts with nylon pull tabs and heavy-duty ABS plastic D-rings.” Brian seam-seals the tarps, and even includes a stuff sack made of the same material as the tarp at no extra cost. The guy-line kit that came with the tarp consisted of a stuff sack made of (I believe) the Spinnaker material and had 10-6 foot pieces of guy-lines. The tarp is listed at 16 oz, according to my scales it is 17 oz including the stuff sack. With the guy-lines attached to the tarp, inside the stuff sack, the weight came to 18 oz. Since then, I have added self-tensioning line-tensioners using 3/32″ shock cord to all of the tie-outs except for the guy-lines attached to the ridgeline. I have also purchased more of the line and now have 10 foot guy-lines on the ridgeline, and 6 foot guy-lines at the remaining tie-outs. 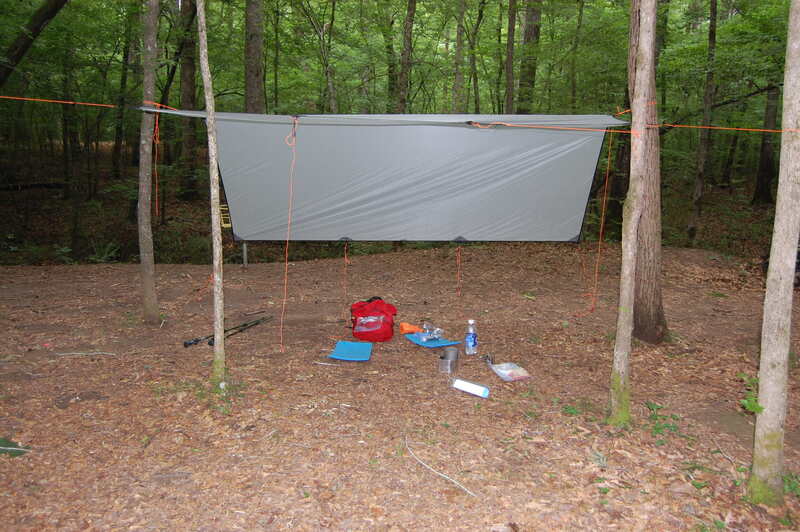 (Also, while the OES site does not specify, the guy-lines that came with the tarp matches the MLD LiteLine exactly.) The weight for the tarp, with all the above mentioned guy-lines and line tensioners, and 14 of the MLD LineLocks inside the stuff sack weighs in at 18.9 oz. This is not bad at all, this thing is huge! The tarp is very neat. I have only been able to use it on an actual trip once, a few weeks ago on a car camping trip. My son and I slept underneath it comfortably. I had it pitched low in the A-Frame pitch because we were expecting rain. (It never rained though.) I plan on taking the tarp with me and my son on a 3-day hike over Memorial Day weekend, and again on a 3-day hike in Sipsey Wilderness a week or two after Memorial Day weekend. I have pitched the tarp numerous times in my back yard just messing around with it. I have come to find that I wish I had some tie-outs in other places. Brian gives the option to add extra tie-outs when ordering the tarp, however I had no understanding of a tarp, so I did not know where I needed them. If I could add extras, I would have one extra in the middle of the long side so that I could pitch the tarp in a half-pyramid pitch. I would also have 4 extras on the top of the tarp. Imagine dividing the tarp in quarters, then add one in the center of each section. This would allow me to lift the tarp up and away from me to give me more room on the inside. Of course though, these extra tie-outs would add more weight to the tarp. I have found that I really like the D Rings rather than grommets. While there is arguments over it, the D Rings do not require putting an extra hole in the tarp which could increase the likelihood of the tie-out tearing out. The D Ring is attached to a nylon strap that is sewn onto a section of coated Oxford, then triple-stitched to the actual tarp. Also, the large D Ring holds the tip of a trekking pole well and it is very easy to tie the guy-lines to the D Ring. So far, I do like the tarp. I have found that it will indeed stretch in rain showers, which is why I have added the line tensioners. I have not been able to adequately test how well they do yet though. I am looking for the opportunity to do so though…..
A tarp’s appeal is the light-weight, its simple set-up (once learned) and it’s versatility. With a tarp you can stow it anywhere, even in an outside pocket. It can be pulled out quickly and set-up to get out of an unexpected shower, or just to set up to enjoy a lunch in the shade. And there are so many different ways to set up a tarp, it is not like a tent that set’s up one way and that is it. However, a tarp still needs structure. This is either accomplished using two trees or 2 trekking poles or one of each, and of course stakes. Again, it all comes down to the type of pitch that you are using. So, for my first tarp, I will say I am impressed with what I have. Brian at OES was very patient with me, even with his busy schedule. He has even offered for me to send the tarp back and he would add the extra tie-outs on for me for a very nice price. I just can’t stand the thought of not having it for that long! So, while there are a few other places to get custom tarps that I am sure is just as good quality, you definitely can’t go wrong with Brian’s OES tarps and I highly suggest you checking them out of you are interested. And once I get this tarp out for a few more nights I will write a more formal report and be sure to post it. Update: Just wanted to make note that I have been able to use the tarp twice lately. I used it this past weekend on a trip to Cheaha State Park for a night and then today on a day hike to Tishomingo State Park. I used it overnight in the rain, and it did well. (You can read about the trip b clicking on the above link to Cheaha SP.) I also used it today to just provide a form of shelter so that I could cook breakfast on my hike. Today it did not protect me from any real elements, but I just wanted to pitch it to try to get used to pitching it in different settings. So I just wanted to update the post. I am enjoying the tarp, and am anticipating using it again, and again, and again….. (so maybe I will update again next time with some real information). Update: This past weekend I was able to use the tarp for two more nights. I had intentions of making it out a third, but didn’t make it. Now, this was also in my yard at home (I am n call so I can’t go anywhere). The first night it stood up to a thunderstorm, the second (the night I missed) temperatures dropped to 23 F and then last night the temps again dropped to 28 F. So, the tarp got to see its share of rain as well as cold weather. 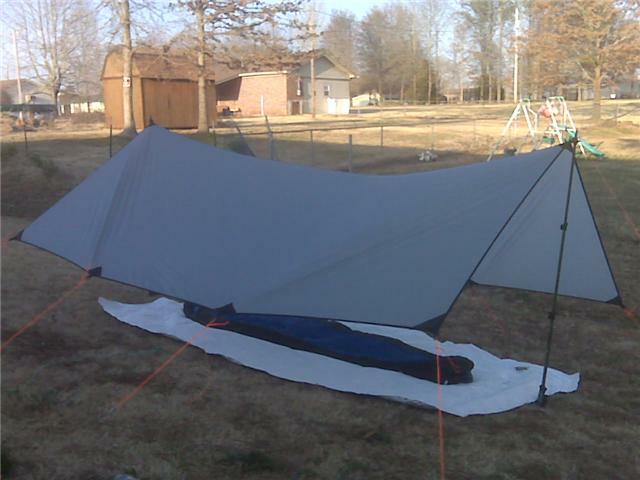 So I went out last night about 8:00 pm and set up my OES tarp. Of course by this time it was already raining so setting it up was interesting in itself. I actually tried the flying diamond pitch first, but being that this tarp is so long, and my trekking poles are only so tall, that wasn’t a good option for me. So, I went with the A-frame pitch which is seen in the video. I pitched the low-end (the back) into the wind and rain and the high-end was the front, naturally. Since the tarp is 10 feet long, this allows plenty of room inside to get closer to one end without being to close to the end (know what I mean?). This worked great. The blowing wind and rain never got anywhere on us throughout the night! There was one occasion in which I felt some misting. I imagine a really big drop hit right above where my head was and the sheer force allowed the mist to get through. In the morning, the top of our bags were completely dry so if there was any other misting it was very faint. The temperatures did drop to 30 F last night. Of course with the wind and rain, it felt a little colder than this, but we stayed nice and warm inside our sleeping bags. I used the Gossamer Gear 1/8″ ThinLight pad on top of the NeoAir last night. I didn’t feel like I needed it since the ground was not cold at all (it had been 60’s and 70’s the few days before last night) but simply because I was curious if it would bunch up under me or cause any discomfort. Happily, I can say I didn’t even notice it! I slept super comfy again, so I believe that this set-up is perfect for me. (Really, I don’t think it could get any better…) Cool thing about using the GG pad is that the pad helped my Cocoon Ultra Light Air Core pillow to stay in place. The GG pad actually kind of stuck to the polyester side of the pillow, holding it in place all night. So, I just wanted to share another outdoors experience, even if it was in my backyard again. And actually, I have left my tarp up today because I plan on sleeping outside under it again tonight. No rain, but temps down in the 20’s!